Notice the bookstore parameter in line 1. We use this variable thoughout the Immediate Function to append new operations to it. 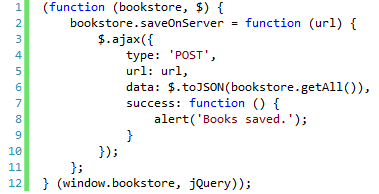 In line 25 we pass a new object to the bookstore and keep it in a global variable window.bookstore, which enables us to access bookstore anytime in our application. In addition, after the function is executed the variable books is discarted maintaining the global space clear.